Kitchen renovations will test your patience. I’m currently in the middle of one right now and it’s been a true test of character. They aren’t easy. It’s messy and chaotic, but I’m trying to be positive and remember the light at the end of the tunnel: a brand new kitchen. I tried to prepare ahead of time to ease the inconvenience of not having a kitchen for several weeks. I’ve heard horror stories of people who were without a kitchen for months and months. My hat tips to you because it’s not easy! 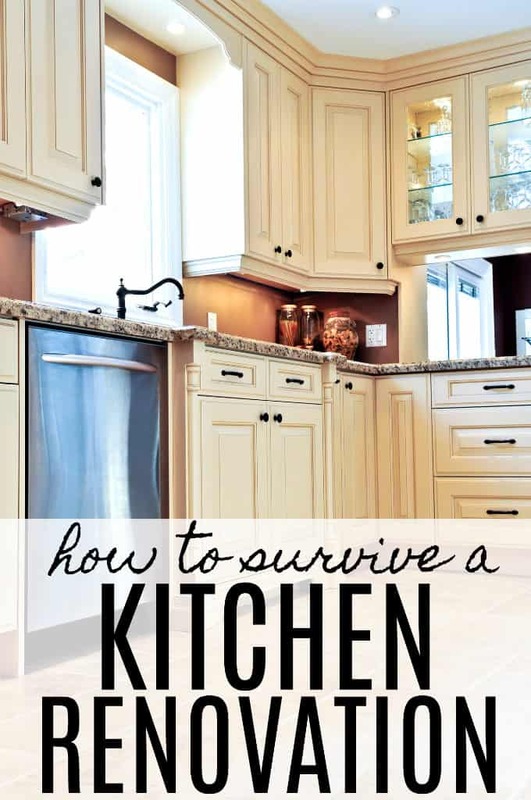 Today, I’m sharing how to survive a kitchen renovation so you can make the most of this stressful time and not let it disrupt your life…too much! 1. Hire a reputable contractor. If you’re hiring out, make sure you do your homework. You’ll want a contractor that will get the job done in a reasonable amount of time and not leave you hanging. I hired an electrician to rewire my house and he took over a year to get the job done. He would come and do a little bit of work and then leave and we wouldn’t see him again for 6 months. You don’t want that to happen when you are doing your kitchen! If you are doing the job yourself, make sure you order all your items ahead of time before you start the demolition. The cabinets can take 6 to 8 weeks to come in. We started in March with the planning and it wasn’t till end of June that the renovation was finished. 2. Label your boxes. Your label maker is your friend when you are packing up your kitchen. Pack like items together and label everything. This step will make unpacking much easier and if you realize you need something during your renovation, you’ll know where to find it. 3. Designate an area as your temporary kitchen. For us, it was a corner in our living room. I set out dishes, non-perishable food, our toaster, microwave oven and hotplate. It was cramped, but it got the job done. 4. Fire up the grill. If you are renovating during the warmer months of the year, take full advantage of your backyard BBQ. We ate BBQ food almost every night during our renovation. 5. Make meals in your microwave. Frozen dinners are your friend. Buy foods you can prepare in the microwave. It may not be the healthiest, but at least everyone will be fed. 6. Freeze meals ahead of time. If you are thinking ahead, prepare frozen meals and put them in your freezer to use during the renovation. Then you can just pop them in the microwave and dinner is served. 7. Clip takeout coupons. We often get “junk mail” with coupons and menus for local restaurants. Save them and use them during your renovation on the nights you don’t feel like cooking. A little planning ahead can save a few bucks. 8. Buy water bottles. You don’t realize how much you miss your kitchen sink until you don’t have one. My kids weren’t fans of “bathroom water” so I bought some cases of water for them to drink. I know, it’s not the most environmentally friendly tip, but you do what you have to! 9. Use paper plates and disposable cutlery. Our bathroom sink is tiny and we have no storage space in there. It makes doing dishes a nightmare because there is no where to set anything down. Buy paper plates and disposable cutlery to save time during clean up. My kitchen is almost done. We are currently waiting on the countertop, sink and cooktop to be installed. I can’t wait! It’s been stressful and I’m counting the days until my life can go back to normal. Do you have any other tips for surviving a kitchen renovation? I’d love to do a kitchen reno, and I’ve watched some of my neighbors go through it. These are helpful suggestions! We have done a mini kitchen reno and it was a challenge, but in the end the little things you have to do to get through it are worth it. I just went through a kitchen renovation so I feel your pain! Great post – you are braver person than I am. I don’t know if I could do it. But I guess focusing on the end result would help. PS: I probably wouldn’t be a fan of bathroom water either! We did it last year – my best tip is to borrow or buy a hot plate. Six weeks without anything but a microwave is tough. That hot plate saved our sanity:-) even though it was tough to cook on and made a mess, it felt like a bit of normal life to have an omelette or BLT sandwiches. Your kitchen looks fabulous! I love the ‘freeze ahead’ idea. Pretty much any time you open up used__.ca or kijiji.com or go to Value Village you can find a Vacuum sealer – it’s great for doing individual meals that can be boiled in bag or microwave. Your tips are great. I may add relax, relax, relax as there will be delays and you just have to go with the flow…. I know all about this! We moved into a new home and had to wait 3 weeks for the new kitchen to be installed – there was no old kitchen so no sink either. I bought a single hot plate and that was used mostly for the food. Our bathroom sink was small too and no where to put things down. So towels on the floor and everything was put on those to drip dry. It certainly wasn’t any fun with 3 kids moaning 🙂 However in the end it was worth it when my beautiful kitchen was installed – I still miss that kitchen. I am not a fan of bathroom water either. I know it’s the same water but there’s something psychological about drinking it from the bathroom tap. A kitchen reno does not sound fun at all but the result certainly does. Very good tips. I haven’t had that done and have no plans. I would give anything to be able to remodel my kitchen. It needs it so bad, but i have heard of horror stories of people not hiring the right people. I would have to make sure to hire someone who is really good at remodeling kitchens! My family and I really want a kitchen renovation in the next couple of years. Thanks for the excellent tips! Funny how everyone is different. I love “bathroom water” it always seems colder to me. We’d love to renovate our kitchen – hope I remember all these great tips. I’ve been waiting for my kitchen to be renovated for 20 years and still nothing because my husband keeps giving me excuses. I have all these plans and pictures but there’s still nothing ! Oh well maybe some day ! I’d love to reno my kitchen – it’s fairly sad. It’s taken me 5 years to get it looking ok but I know it needs to be done. Thanks for the hints!! I’ll keep them in mind for when I finally get it together enough to do it. The tip to label boxes is a great one, will have to remember that for when we finally get to renovate our kitchen. I really like your idea to utilize the grill for home cooking while the kitchen is under construction. I want to renovate my kitchen and I’m concerned that the process could get rough if we’re always having to eat out. It’s something to keep in mind to ensure that even if the process has a few hiccups, I’m able to cook food for the family without too many issues. I have to totally agree with you point #1. It’s a horrid to hire a subpar contractor with awful quality of work. I was renovating my kitchen that day and the wall was poorly done. I had a fair amount of argument with the contractor. Cut the story short…alwasy go for a reputable contractor!